District Attorney Vern Pierson discusses the Project LEAD program with Sierra School students at the Civic Learning Award of Merit presentation assembly. On Friday, April 6, Sierra School became one of 65 California schools to be honored with the Civic Learning Award of Merit from the State of California’s Chief Justice and Superintendent of Public Instruction. The award recognizes Sierra School for their partnership with El Dorado County’s Office of the District Attorney, Superior Court, Sheriff’s and Probation Departments along with Placerville Police Department through Project LEAD (Legal Enrichment and Decision-Making). Project LEAD brings the courtroom into the classroom where students learn about the legal system, a variety of professions and how to make good decisions. Over the past three years, District Attorney Vern Pierson has teamed up with Sierra School for multiple rounds of Project LEAD—an innovative approach to crime prevention that teaches children that the choices they make today can affect their lives forever. 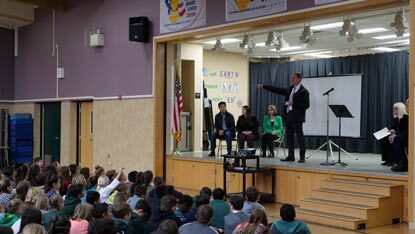 Through Project LEAD, prosecutors from the District Attorney’s Office visit fifth-grade students at Sierra School once a week to provide an introduction to the criminal justice system and to promote positive decision-making skills. The hour-long lessons focus on the legal and social consequences of juvenile crimes such as truancy, illicit drug use, shoplifting, and graffiti. Students engage in group discussions and role-playing scenarios to become acquainted with common pressures that lead to delinquent conduct and to practice refusal skills to deter criminal activity. Project LEAD culminates in a mock trial held at the El Dorado County Superior Court in Placerville. The trial—conducted entirely by students who play the role of the judge, prosecutors, defense attorneys and courtroom staff—introduces hallmark concepts of justice such as the right to counsel and proof beyond a reasonable doubt.